If it’s your first visit you might be wondering what to pack for India – it isn’t quite as straightforward as other destinations. These are the top ten items for india always in my case / backpack. One of the most important of the top ten items for india is Malaria prevention. Malaria tablets and Mosquito spray. Check before you go whether you are in a Malaria zone. There are other mosquito transmitted diseases – Dengue fever, Chikungunya and Japenese encephalitis. And don’t forget the charger. I would advise a spare also. Try the 10ft charger in the Amazon ad above. Why a 10ft charger ? The plug socket may not always be near your bed and when I’m asleep i like my phone as close as possible. Or in the airport there may be sockets but people sat in front of them. You can plug it in but still sit a few seats down with the phone still on your person. The Portable Power Bank for mobile phone is another indispensible travel item – you may be out and about and not near a plug to recharge. Or on a long train journey. Or perhaps you take lots of photos and videos (guilty) or listen to music on the beach (also guilty). I’m glued to my phone at home but superglued to it in India and it’s essential that it doesn’t run out of battery. If it does simply plug it into the power pack and you have extra life – then recharge the power pack when you get back to electricity supply. My last trip to India was the first time I had taken a powerpack – the airline I flew with – Emirites – requires them to be taken in hand luggage so don’t pack in the bottom of your suitcase. Number four of the top ten items for india is a good camera. My tip – buy a memory card with as large a memory as you can afford like this SanDisk 64GB Memory Card for instance. Or maybe it’s just me – I take thousands of pictures ! I’m looking to upgrade my camera and after careful research I have narrowed the search down to these two – the Canon EOS 1300D or the Nikon D3300 . Both great for beginners with good results, good reviews and, most importantly for me, they both have plenty of tutorial videos on Youtube. If anyone has experience of either of these two do let me know how you’ve got on with them – or if you would advise another similiar priced camera. You can pick these up at airports but you will save money if you buy beforehand. Many good hotels facilitate uk plugs but smaller ones and beach shacks do not. Take a spare , they’re easy to lose. With the exception of one trip to India I experienced power cuts so this is definitely in my top ten items for India . Once while I was in the loo. And the torch was in my bag. Which wasn’t in the loo with me. It was scary. Bring this powerful yet lightweight Super Bright LED Torch . It also gets dark really quickly – not the gradual fading of the light as in the UK and depending where you are you might find it comforting to have a torch with you even if just to light your path so you don’t trip on anything. You could of course just use your phone if you have a torch in there but I would advise that you reserve your phone battery. Include sanitary items, condoms, favourite shampoo/conditioner, small shower gel ( buy some there ) bare minimum make up – mascara and lip gloss in my case – toothbrush etc, painkillers, imodium and electrolytes sachets (dioralyte), hand sanitiser, antiseptic cream or spray and any prescription medicines. Take photos of prescriptions with your phone before handing to chemist. Just in case they are ever asked for. I buy mine from Primark for 90 pence. 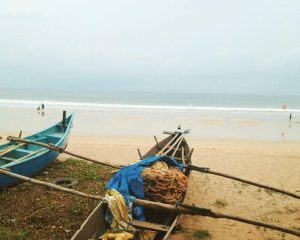 I take dark coloured shoes to India – the sand on the beaches tends to stain – a white pair I took once were orange by the end of the trip and no amount of scrubbing would revert them to their original colour. Ditto with light colour bikini’s and shorts by the way. If you like something a little sturdier than flip flops but light and easy to slip on and off then these birkenstock eva sandals are brilliant for travelling – just like normal birkenstocks but waterproof. Generally don’t take too much clothing to India as you can buy clothes cheaply there. Research the weather for where you are going – mostly its going to be hot ! So light clothing but remember in many places you shouldn’t expose too much flesh – and for women that includes shoulders and legs. So long sleeve lightweight tops are best for off the beach in all but the most touristy areas. Men can wear vest tops and long shorts. And long baggy light trousers are also modest and good for mosquito protection in the evening. Bikinis can be worn on the beach or by the pool but leave your most skimpy swimwear at home. No thongs here ! Hat , glasses and sunscreen. You can buy hats there no problem but sunglasses I didn’t find any the quality I liked. Sunscreen you can buy but if you have a brand you trust then bring it with you. Lastly – when travelling it is usual to obtain currency before you go. For India thats not possible. Read my blog about India Rupees to find out why. There we are , thats my top ten items for India – what’ yours ? Thank you if you buy anything via any of the Amazon links on this website – it earns me a small commission which helps me to pay to host this website. Does Avon Skin So Soft work as mosquito repellent ? Does Avon Skin So Soft work as mosquito repellent ? You may have read this in the press or on the internet and wondered if it is really true. A friend I recently travelled with to India, who normally gets heavily bitten, swears by it. Having tried everything else, including Jungle Formula, without any luck it was strangely me that had suggested it to her a couple of years ago, when she travelled to Africa volunteering. I had read online but still wondered to myself – Does Avon Skin So Soft work as mosquito repellent ? She tried it and wasn’t bitten once. 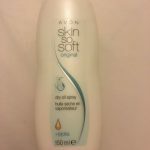 So I thought I would give it a try – and purchased these sprays – Avon Skin So Soft Original Dry Oil Body Spray with Jojobal 150 ml – Pack of 2 from Amazon. Normally I just pack a deet based product – Jungle Formula – as this one definately works for me. But this time I took Avon Skin So Soft as well. Without protection I get bitten horribly. To make it worse each bite swells to a red blotch over a centimetre in diameter and is intensly itchy. I don’t particularly like the smell of deet but I tolerate it preferring that to being bitten and risking malaria, denge fever or anything worse. It also strips my nail varnish off which is a bit of a pain. As I prefer not not to use harsh chemicals if I can help it I wanted to give Avon Skin So Soft a try. Research online advocates that it was used by the SAS , TA , Royal Marines and the contestants in I’m a Celebrity Get Me Out of Here. So while I was in India I used both products on alternate days. They were equally as good I have to say. Success depends on how thoroughly you apply the products. If you miss anywhere and you’ll still get bitten. But anywhere I had sprayed, with either product, remained bite free. Did I get bitten at all ? Oh yes ! One evening after a day of keeping very close to the toilet ( Dehli belly ) I ventured downstairs to look for my friend. Instead i found a very interesting German businessman who was so fascinating I sat and talked to him for a couple of hours. After being bitten a few times I remembered I had forgotten to put anything on and was too lazy to go back to my room and do so. And figured as only my wrists and ankles were exposed I wouldn’t be too badly bitten. How wrong I was – about 100 bites in total and looked horrendous. The itching gave me a few sleepless nights that no after bite cured for very long. So does Avon Skin So Soft work as mosquito repellent ? YES – I would recommend it – just remember to put it on! And if you are in India another handy discovery I made was SALICAL . 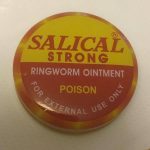 A tiny 15mg tin of ointment labelled ‘Poison’ and ‘Ringworm ointment’ . I was down a tiny back street off AJC Bose Road in Kolkata searching for after bite as I had exhausted my friends supply. The gentleman didn’t understand English so I pointed to my awful mosquito bites and he handed it to me. I read it and saw ‘ringworm’ . Tried to explain to him that it was in fact mosquito bites not ringworm but he assured me ‘yes for mosquitos’. So I bought it – 20 rupees – about 25 pence – and it was absolutely brilliant ! A little went a long way and that night I slept like a baby. Also if you are travelling from uk to India you will need adapter plugs and it’s much cheaper to buy before you get to the airport. Confusingly India use both 2 prong and 3 prong (rounded) so this handy pack of two has one of each. DISCLAIMER : THIS ARTICLE IS NOT MEDICAL ADVICE – it is a report of my experience only. No mosquito repellent is guaranteed foolproof so please also talk to your healthcare provider to assess if you need malaria tablets where you are travelling to – remembering that the course of most tablets has to be started well in advance of travelling. Has Avon Skin So Soft worked as mosquito repellent for you? Why not leave a comment to share your experience of Avon SSS in the comments below.